NBC’s “Powerless,” the upcoming half-hour comedy series by DC Comics, has an official date to air in the small screen: February 2, 2017. The series is set in the DC universe, and it will focus on the lives of regular employees in an insurance company who manage the fact that they live in a world with superheroes. 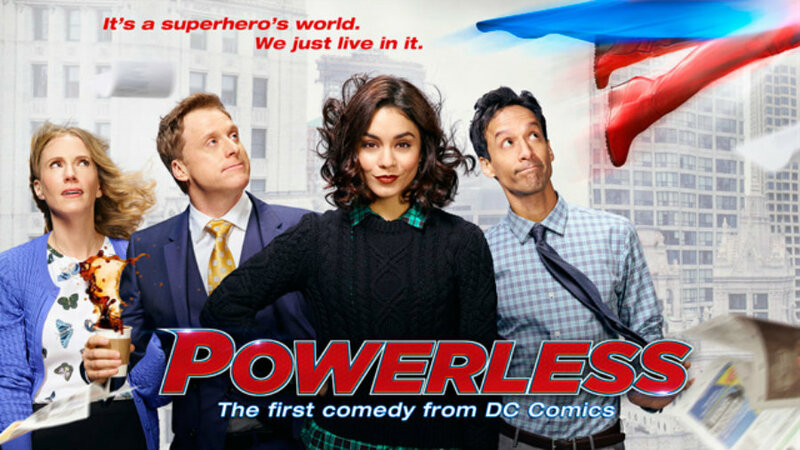 The debut of “Powerless” was supposed to occur this fall. However, it was delayed to “sometime in 2017” as NBC stated it. The good news is that through the recent release of its mid-season series schedule, the premiere date was set in just two months and will air at 8:30 p.m. It hasn’t even aired, and it has already obtained good reviews. The series is set in the DC Universe; therefore, superheroes and supervillains will be appearing throughout the episodes. For example, two of the confirmed superheroes are Jack O’Lantern and Crimson Fox. As well, there are rumors about the appearance of Aqua-man and the Wonder Woman during some episodes of the series. The pilot was approved in August 2015. As well, the series will count will great Hollywood stars such as Vanessa Hudgens, Danny Pudi, Ron Funches, and Alan Tudyk. Ben Queen developed it for NBC. Powerless is being shot in California. Alongside the premiere date of the series, its official synopsis was published, which describes the story of Emily Locke (Vanessa Hudgens) who starts her first day of work as Director of Research & Development for Wayne Security, an insurance company. They live in a world where humans must face the collateral damages derived from the battles between Super Heroes and Super-Villains. “Full of confidence and big ideas, Emily quickly learns that her expectations far exceed those of her new boss (Alan Tudyk) and officemates, so it will be up to her to lead the team toward their full potential and the realization that you don’t need superpowers to be a hero,” continues the official synopsis of the series. The series shows a fresh and unique perception of a world where superhumans live since it is not focused on the adventures of the superheroes but in the lives of ordinary people with ordinary jobs, with the peculiarity of living in a world surrounded by people with actual superpowers. Right now, we can’t be sure about all the super people appearing in the series. However, we have already a familiar name: Wayne.